This is the second in a series of posts on films shown at the First International Film Festival for Persons with Disabilities. The Festival, recently held in New Delhi, was presented by the Ministry of Social Justice and Empowerment in collaboration with the National Film Development Corporation of India. Her questions were met with silence. It was only when she said her son was a gold medalist in the Special Olympics, and a National Awardee that people burst into applause. Allowing for the fact that many people in the audience were still figuring out how to best respond when the woman was being vulnerable and asking a complex question, and that applauding her son’s achievements was an act of support and admiration, this still got me thinking. Are we more comfortable extending love and admiration to children with disabilities when they are portrayed as ‘heroes’? This question had been playing on my mind ever since I’d watched Mahesh Limaye’s Yellow at the same festival a couple of days before this discussion took place. This feature film stars Gauri Gadgil, whose story it is inspired by. 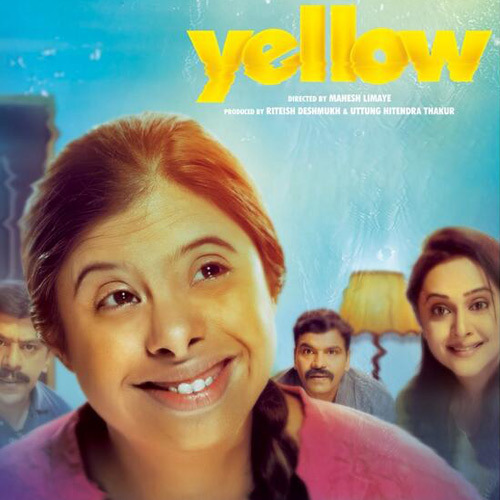 In the film, Gauri’s father abandons her after he realises she has Down’s syndrome. Gauri and her mother, Mugdha, move in with Mugdha’s supportive brother Sree. Mugdha enrols Gauri in a school for children with disabilities, and gets a job teaching at the same school. Through a series of circumstances, Gauri is enrolled in swimming lessons, where she proves to be a very good swimmer. Gauri is endearing in her role as a mischievous child who is enthralled by fairy tales, and annoyed by her swimming instructor’s foghorn-like training whistle. With the encouragement of her mother and uncle, and the rigorous training provided by her instructor, she becomes a swimming champion, and an inspiration to the other children in her school. The film ends with an exhortation to support children with disabilities in the way that Gauri has been supported. I watched Yellow in an auditorium full of school children. They cheered for Gauri whenever she was shown participating in the swimming competition. They cheered for her swimming instructor whenever he appeared on screen, portrayed as a ‘macho’ and unyielding man who lives to watch his wards win competitions. But there are some things that bothered me nonetheless, like the fact that a majority of the coach’s aggression is directed at Mugdha, who is concerned that the punishing schedule is exhausting Gauri and making her ill. There is also the fact that in order to win her final competition, Gauri has to do breath-control, which is deemed unsafe for her by her doctor, but that her coach insists that she do it. Sometimes, the narrative becomes about the coach’s hyper-masculine desire to win, and not about Gauri. There is also the fact that we know nothing about Gauri’s mother’s life beyond her anxieties about Gauri. Mugdha’s only friend, the grandmother of an adult student at Gauri’s school, is killed off unceremoniously to make a point about her own anxiety about Gauri’s future. This, to me, is the weakest point of the film. Does this mean that children with disabilities do not have the right to take risks, as Gauri does in her final competition? Does this mean that people with disabilities should not be portrayed as admirable, as role models, as stars and heroes – which able-bodied people are on a daily basis? Not at all. Gauri’s story is a testament to her achievements, and demonstrates what children of any ability can do if they are given the right care, support, and access to resources. However, Yellow left me questioning competition as a serious benchmark of achievement in our world, for anyone. It is not Gauri, her family, or her coach that can be faulted for playing by the world’s rules — it is a world that only prizes the victory of one at the expense of others that must be critically examined. Read the first post in the Film Festival Diary on two films about family and deaf culture.